Objectives: Using a crate is important for many reasons. House training, boarding, possible veterinarian visits where they are staying hours or overnight, safety in the house (puppies will try and chew wires and all sorts of things left to their own devices), just having a shower without worrying about what puppy is getting into, and separating out from company that may be afraid of dogs, in general. The objective is to create a peaceful place where your puppy or dog knows they are safe and comfortable to rest and relax. Equipment: Crate, flat collar on dog (so you have some hold on him putting him in or out), toys placed in the crate already, and a lot of patience. You don't want your puppy to see you getting frustrated. This is all a learning experience for them. STEP 1: With a pretty confident puppy, I will say crate and place him right in. If he resists to much on the collar, I would pick him up and place him in the crate. If he goes willingly with a light collar tug, let him know he is a "good boy" by saying good boy and giving him a bit of a scratch on the chin after he is inside, being sure not to let him make a move to go back out. A treat would be totally acceptable for this as well. STEP 2: Close the door and walk away out of sight. Do not look back or in any way comfort or talk to the puppy, even if he starts whining right away. STEP 3: Wait for that moment of silence. Walk back immediately, have him sit (you could lure him with a treat if he does not sit right away, but he was doing well here), and open the door if he is quiet (only). If he starts the whining as you are walking to the crate or starting to open the door, walk away quickly again, and wait until he becomes quiet. Day 1: First day, I would do much like we did and do a few reps with us returning immediately. I have him sit and be quiet while I open up the door and release him with a word like "break". Since we haven't worked stay as yet, don't require him to sit there for any length of time beyond a couple of seconds. Day 2: Second day, I am looking for a few minutes of silence and once that happens return and let him out to play. I would spread those reps out about an hour or so apart. These are now totally separate instances and not all in a row. What this means is he needs to do 3-5 minutes of silence all at once before I return. He needs to sit (you can lure at this point), and be quiet as I open the door. So any break without the release word given first means that I reset the clock again. 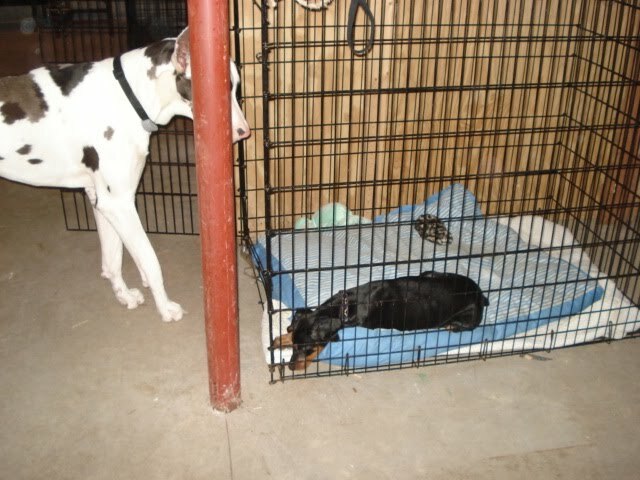 At some point you will notice that puppy starts to relax in the crate and get preoccupied with toys or sleep. As long as he has his exercise and play times met, he should be like most puppies and realize it's no big thing. It is not a bad idea to have the crate in a separate room as you do, so he doesn't get distracted by seeing the family members that he wants to play and be with instead. If he starts to be nice and quiet on his own with no fuss, let him start to be until you are ready to work with or let him out again. Some puppies, as mine did, get very cued in by the sound of feet. Occasionally there can be another step needed to proof the puppy not to cry if footsteps don't come his way. Being that you have a family of children and adults there, he will probably not have a time that he does not hear footsteps of some sort, and that will be helpful to you. So automatically, he will need to learn to ignore that distraction. This problem can happen if there is only one handler alone with the puppy at a time training for this. If it is necessary for the dog to be trained while other family members are not there, once the dog learns to be quiet for a few minutes and that you will return, you can start make audible footsteps around an area while not going to him and expect him to ignore that for a period of time followed by silence before the handler returns to him. The beginning part relies on the fact that he knows that noisy puppy equals the puppy not getting what he wants, only his being quiet ensures that. So we return immediately in the beginning to set the puppy up for that realization. Then we need to be sure that footsteps don't mean that the puppy is entitled to release just because he hears his family member. NOTE: Puppies learn at their own pace. If he takes longer to become comfortable at shorter intervals of time, that's okay and don't push him beyond until he is pretty comfortable with A period of time before bumping him up. Sometimes being smart means your puppy will try every alternative to break you of leaving him in there. If he has a special toy, you might want to have that available to him ONLY in the crate, at this point. A puppy finds it comforting to have something to settle down with, and keep him occupied until he gets sleepy. Remember, if you think it's that he needs to go to the bathroom (like in the morning), you may release him to go. When you get to doing the longer times, I would work them around his house training schedule so that he goes out first and that does not become an issue. This works well into house training, as it's my practice that no play or exercise is associated with going out to the bathroom. If you have a working schedule, or appointments to go on, you want your dog to eliminate as quickly as is possible (giving room for the fact that it may not be instantaneously). Usually a good five minute time frame is sufficient, as long as you aren't mixing this in with play or exercise. If you do, they learn pretty quickly that they can keep you out with them longer, by delaying the point at which they go to the bathroom, perhaps until they go inside. So what I do with puppies is they have a period of time where I wait until they are all done, if there is any question, I pop them back in the crate for 20 minutes and then check out whether they need to go again as part of my house training in the beginning. Once that is all over with, they come back inside (most likely eat) and separately we will do our exercise or fun activity. During this crated time in between, you can train your dog on this as well. If they really really needed to go, they would have gone in the allotted time. So you can feel somewhat confident that they will not go in their crate during the training times as you go along. If they had completed number one and two, you can be quite sure that is not the problem.